QAP1E Quick Access Digital Pistol Safe is rated 2.5 out of 5 by 22. The QAP1E Quick Access Digital Pistol Safe is designed to provide top of the line security with solid steel construction, a pry resistant door and bolt down hardware. 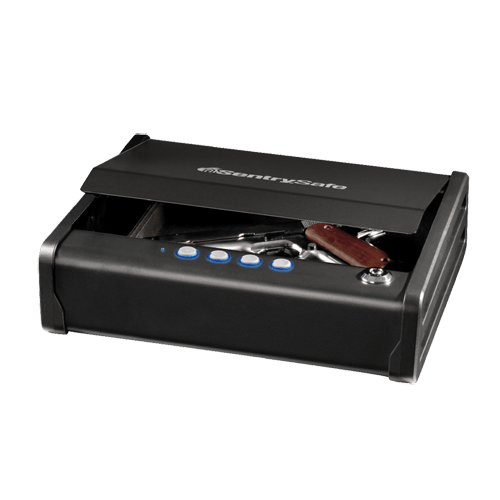 This small handgun safe also offers discreet entry with a compression gas strut for whisper-quiet entry and backlit digital lock that allows for single handed access. Rated 1 out of 5 by Starynatu from Gas strut failure Great safe to keep by the bedside unless you want to open it and be able retrieve your gun fast. Only had the gun safe for a few months and the gas strut has already failed to open. By the time I keep replacing this strut each few months I could have purchased a different safe that doesn't have this problem. 3 month warranty on a product that is supposed to be built to last!!!!! Rated 1 out of 5 by Cris32107 from Look elsewhere I've had the safe for a few months and the shock already failed not too reassuring for when it counts. Better to find out now than later. Keep looking. Rated 1 out of 5 by Rick0909 from Poor Gas Assist Opening Mechanism The safe is great except over time the gas assist cylinder that springs the door open fails. When the code is entered, the door only opens a crack and you have to try to get your finger in there to get it open. In an emergency, this is unreliable and unacceptable. Rated 4 out of 5 by Robert8146 from Reliable and quick to open I purchased to keep my 6 year old grandson's young hands off and still have fast reliable access to a home defense handgun. Plenty of room for a full size .45 and extra magazine and its a breeze to open. Buttons illuminate when you depress one to bring out of its sleep mode to make code entry easy in complete darkness. This is a very heavy duty safe that can be bolted down if desired. It is somewhat large and it is heavy and it is not very good for putting in a nightstand drawer. Mine sits on top of the nightstand and actually takes up about half of the space but it puts my gun at arms length. Two things that I wish were better and would have given a 5 star rating is that there is no way to secure the safe with a security cable if you do not wish to bolt down. That's a big deal if someone breaks in as all they have to do is carry away the safe and pry it open later. The other improvement I wish it had would be additional interior padding on the lid hinge. I have found that when I put my large frame handgun in the safe it is easy to ding the rear sight against the lid hinge. I put a couple strips of duct tape in there and it works fine but that could be an easy fix at the factory. 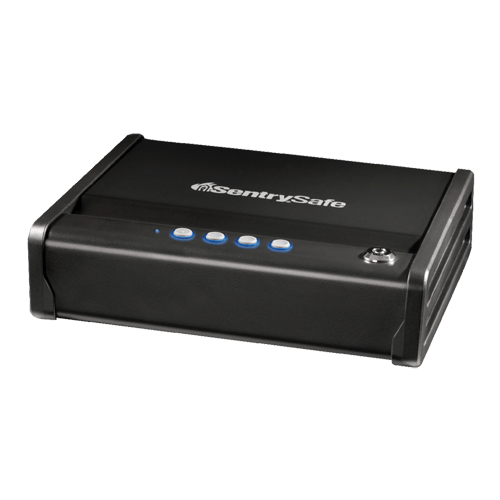 I compared this to many other quick access safes and this seemed to be a much better unit for a much better price than its competitors. Additionally the digital code entry is a far more reliable system than the biometric fingerprint. Anyone with a fingerprint reader on a smartphone knows that it doesn't always unlock the phone on the first attempt and that's not something you want in a home defense gun safe. Rated 2 out of 5 by Disappointed customer from Gas Strut Failure My gas strut failed after about 6 months and i never bothered to replace. It seems this is a common problem. I wish the company would replace. Rated 5 out of 5 by EZconn from Well made. Perfect size for my application I needed a pistol safe large enough to accommodate my S&W .357 revolver. The safe needed to be reliable, easy to open, difficult to pry open and also fit inside a drawer. This safe passes all with flying colors. Rated 5 out of 5 by Cleveland Quade from Safe with everything needed for my needs I shopped a long time online for a pistol safe with whisper quiet lid and back lit keys. The price was very nice and it was at Home Depot. Soooo happy I bought this Sentry. I will recommend this to anyone looking for a good safe at a great price. Did I mention I found it at Home Depot? Thanks.